Jessica of Eco-Friendly Freckles has made something both useful and beautiful, and has done it all with recycled materials (well, except for the collage sheets from my shop, Magpie Mine, but of course she was required to use those as per the rules of the Exchange!) 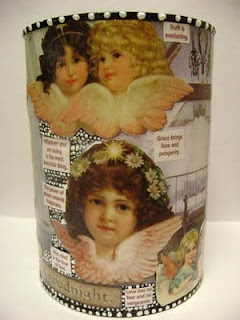 She has done a lovely job creating this adorable angels canister which she titled “Lullaby of Angels’ Enlightenment”. I just love the soft pinks juxtaposed with the graphic white-on-black dots. This is her trademark look ~ visit her Etsy shop to see how she incorporates the dots into all of her pieces! so organization is key. I could use some stylish containers to hold brushes, tools, and pencils since they are now housed in plastic fast food cups ... hmmm ... now what to do with the plastic cups ... of course, I could use the plastic cups to create my upcycled canisters! Jessica's tutorial will also be posted on Totally Tutorials. Just to recap what the exchange is about, since new tutorials will be coming in over the next few weeks: A supplies seller (me in this case :) donates supplies to an artist/crafter who agrees to create something with said supplies and make a tutorial to appear on Totally Tutorials blog. It's been so much fun so far! See the list in my sidebar for recent entries. The list will be growing week by week. This would be a great stylish pen or paint brush container. oh maggie :) this entry is so cool! i just love all the images she chose from your collection! and recycle is GOOD!!! whoot!! ~ Charlie, I know! I have a list a mile long of creative things I want to try. Finding the time is the challenge! ~ Nancy, thanks so much. 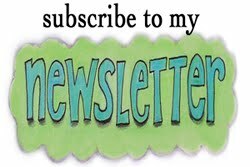 And thanks for your blog post of today. It brought tears to my eyes. 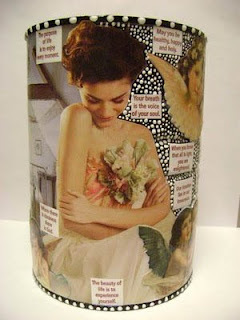 ~ Luthien, I love that all these items have been recycled too! Thank you everyone for all of the complements! I have really enjoyed making my first tutorial! 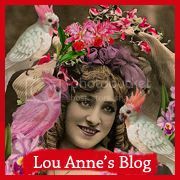 I love how generous you are, Maggie...makes for great art and a really great blog! Sounds lke you live in an 'antique' home, like I do. No closets. No hallways. Small rooms. This is beautiful! 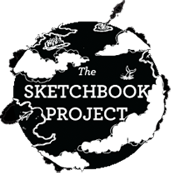 What a great idea for a collaboration! Thanks everyone! I love the Supplies for Tutorials Exchange. It's Dotty's (at Totally Tutorials) idea and I think it's a ton of fun! Lisa, I love old houses! Even though it has almost no closets (there is one in my tiny workroom tucked under the stairs to the 3rd floor that is so narrow it won't even hold a clothes hanger turned sideways), other things make up for it. Like high ceilings and great woodwork!